If you enjoy the sport of hunting, then you may enjoy having a dog by your side on your hunt. It's believed that humans and dogs have been hunting together since the beginning of canine domestication, long before the age of agriculture. Most experts believe that humans and dogs evolved concurrently. Hunting was likely an integral part of the development of each species, especially because it was necessary for each to survive. Over time, hunting became more of a sport than a way of life. Dogs have since been developed by humans into specific breeds with specialized traits. Most of today's purebred hunting dogs are part of the AKC sporting group or hound group. In general, the most common hunting dogs are either considered scent hounds or gun dogs. Gun dogs are often used to hunt birds (and are thus also called bird dogs), though they sometimes hunt smaller prey like rabbits. This type of hunting dog is used to locate prey and flush it out for the hunter to shoot. The dog then retrieves the fallen prey for the hunter. Scent hounds follow prey trails with their noses, making quite a lot of noise while running after prey. This enables the hunter to follow the trail even when the dog is out of sight. Some scent hounds are "running" dogs that focus on pursuing prey. Others are "treeing" dogs that chase the prey up a tree and wait at the base until hunters can arrive. There are dozens of dog breeds that make excellent hunting dogs. The best depends on the hunter's preferences, the individual dog's skills, and the foundation of training. A great hunting dog doesn't even need to be a purebred dog; there are plenty of mixed-breed dogs that make excellent hunting dogs. The Labrador Retriever is one of the most popular gun dogs. This enthusiastic, energetic, and loyal dog breed can withstand cold temperatures and easily swim through cold water. Labradors are often considered best for duck hunting. When not on the hunt, the Lab makes an excellent companion and family dog. In fact, the breed is one of the most popular dog breeds today. 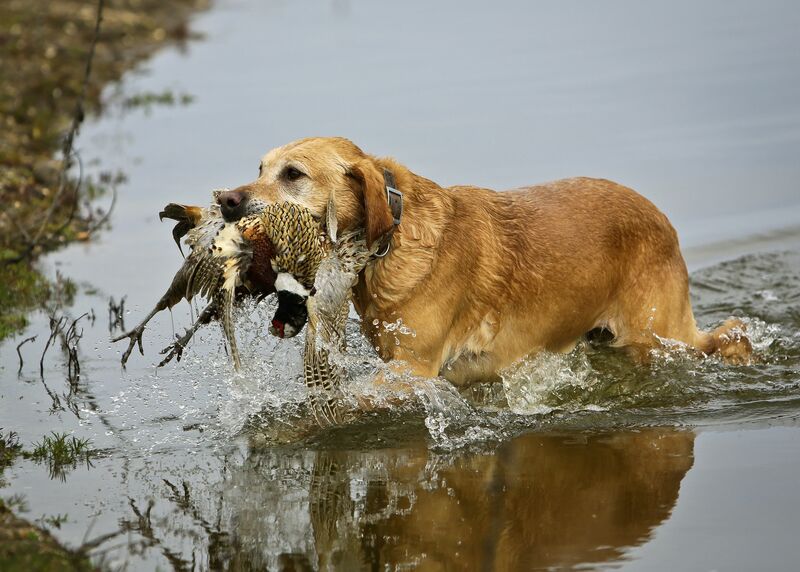 Similar to Labradors, Golden Retrievers are gun dogs that are excellent for hunting birds and other small prey. They are enthusiastic, loyal, and very trainable. They also make wonderful family companions and have a reputation for getting along very well with children. The Beagle is a scent hound with an amazing nose and loud voice. This breed is primarily used to hunt small game, especially rabbits. Beagles also make excellent companions for all kinds of households. The American Foxhound is a scent hound full of determination. This running hound thrives on the chase. Bred from English Foxhounds, the breed was first used mainly to hunt foxes. In time, the breed was used to hunt deer. They are still known as excellent fox and deer hunters (note that there are some legal restrictions with these types of hunting, depending on your location). The English Springer Spaniel is an excellent bird dog that is especially good at flushing out and chasing pheasant. They have retrieving skills that parallel the Labradors and Goldens. The breed's slightly smaller size makes it easier to navigate smaller spaces on the hunt. When not at work, the Springer makes an excellent family dog. The Pointer, sometimes called the "English" Pointer, is a bird dog with a high prey drive and a determined spirit. The Pointer will pursue prey like quail and pheasants with vigor. The breed is also very heat tolerant, therefore suited to the hot, humid South. 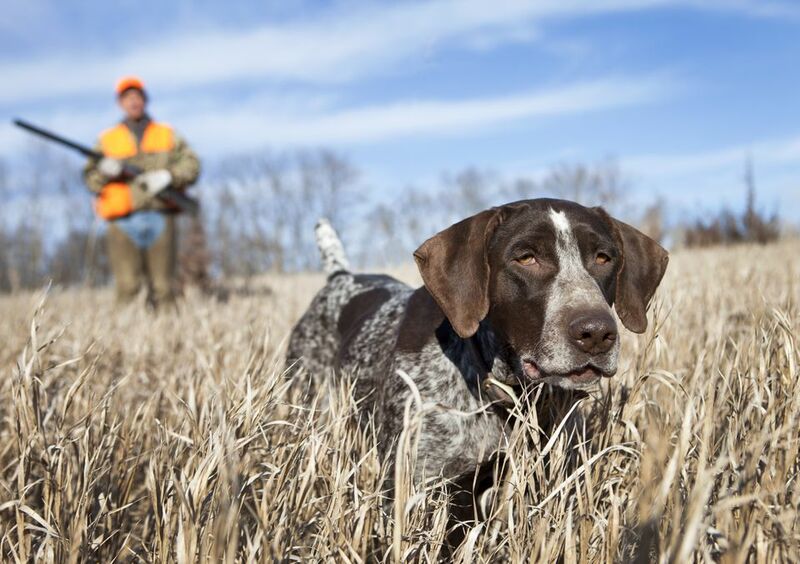 Whether on the hunt or on the couch, a Pointer makes an excellent companion. Similar breeds include the German Shorthair Pointer and the German Wirehaired Pointer. The Chesapeake Bay Retriever is a determined and athletic gun dog. This breed is intelligent and typically quite devoted to its owner. Like the Lab, the Chessie is suited to cold water and temperatures. Unlike the Lab, this breed is not necessarily everyone's best friend. A Chessie is fiercely loyal to its family and makes an excellent companion for active households. The Bluetick Coonhound is a scent hound that can pursue and tree just about any creature it finds. This breed has even been known to pursue cougars and mountain lions. These are high-energy dogs with excellent noses. They are known for being quite vocal, even when not pursuing game. The breed is a descendant of the French Bleu de Gascogne hound and the English Foxhound. The Bluetick makes an excellent companion for very active households. Similar breeds include the Redbone Coonhound, the Treeing Walker Coonhound, and the Black and Tan Coonhound. The English Setter is a gun dog known for pointing, running, and hunting skills. They can be trained to retrieve, making them excellent at bird hunting. As the popularity of Setters rose, they began to be split into two categories: conformation and field. Field dogs are smaller, and more lightly feathered, making them best for hunting. Conformation dogs are more suited to be show dogs and pets due to their larger frames and longer feathers. However, the field Setter makes an excellent companion as well. The Irish Setter is a gun dog known for its beautiful red coat and its graceful agility. Like English Setters, the breed can be divided into show-quality and field dogs. The Irish Setter is tougher than it looks; this breed is rugged, hard-working, and determined to pursue birds. Irish Setters also make friendly, affectionate, and gentle companions for all kinds of families. If you choose to get a dog for hunting, remember that hunting season is only for part of the year. Your hunting dog will also be your companion and needs to be properly cared for. Dogs are social animals that will not thrive if forced to spend the majority of their time in a kennel and separated from humans and other dogs. Take the time to train and care for your dog all year long. The closer your bond with your dog, the better hunting partner that dog will become. Be aware that laws pertaining to hunting with dogs vary by region. Some areas prohibit hunting certain kinds of game with dogs. Be sure to research the law and obtain the proper licenses and permits prior to hunting with or without your dog.